Joseph Henri Maurice Richard at the wheel of the Škoda Felicia donated by Podniků Zahraničniho Obchodu Motokov, Prague, Czechoslovakia. Anon., “–.” Le Devoir, 18 March 1959, 10. Hello, and welcome to another edition of our blog / bulletin / thingee dedicated to aviation and space that will not discuss aviation or space. I must admit to having been intrigued by the photo above. I’ve never seen Joseph Henri Maurice “Comet / Mr. Hockey / Rocket” Richard, a big star of the Club de hockey Canadien Incorporé, an organization mentioned in a July 2018 issue of our blog / bulletin / thingee, shoot and score but I have often heard about this man over the years. First player in the National Hockey League to score 50 goals in 50 games, during the 1944-45 season, Richard was also the first to reach 500 career goals – a feat achieved in October 1957. Arrived at the Club de hockey Canadien in 1942, he retired in 1960. 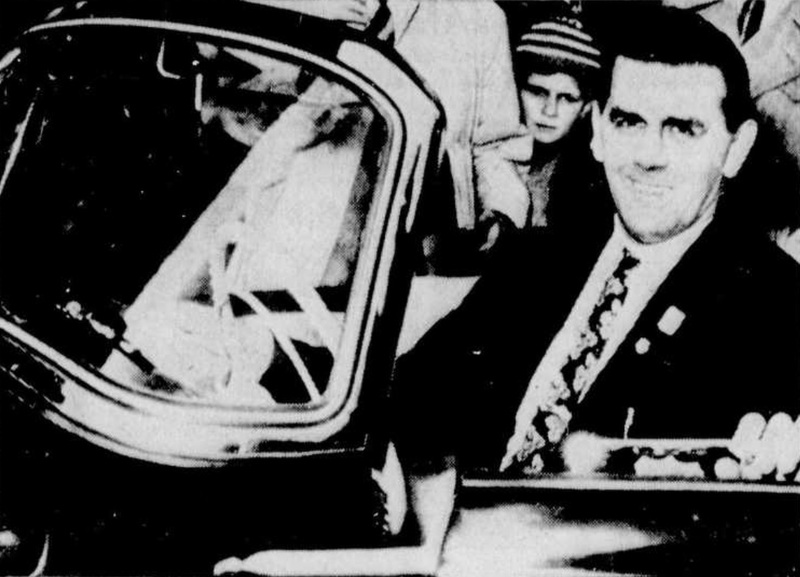 Maurice Richard displays the proudest of smiles as he sits at the wheel of his magnificent Skoda-Felicia, a gift of Motokov Enterprises. The Rocket brought his vehicle with him from Prague to Montréal without having to pay customs. With what aspect of this story do you want to start, my reading friend? If you don’t mind, I will start the discussion with a brief pontification on the Ice Hockey World Championship held in some cities of Czechoslovakia in March 1959. Anxious to promote the publicity surrounding this event and conscious of the possibility of making a killing in matters of propaganda, the Czech government invited Richard, in late February, to attend a number of games. Inactive since January because of a broken ankle, the former asked the management of the Club de hockey Canadien if he could make the trip. The latter had no objection. Richard left Montréal for New York, New York, where he took off for Paris aboard an airliner of the Compagnie Air France, which was certainly a bit curious. The crown corporation Trans-Canada Air Lines, today’s privatised Air Canada, offered scheduled flights to Paris. Anyway, let’s move on. Dozens of journalists and photographers rushed around Richard to such a point that, when he stepped out of his airplane, in Prague, Czech dignitaries had trouble officially welcoming him. Richard was both amazed and touched by the reception reserved for him. The Czech government was determined to show their guest of honour the most beautiful aspects of the country. Richard’s schedule was, to say the least, loaded with factory visits, receptions and attendance at hockey games. He went to the shops of a state-owned company, Automobilové Závody Národni Podnik (AZNP), for example. Some statements made by Richard about the absence of poverty and the degree of satisfaction of Czech workers made some Québec commentators jump. They openly made fun of him. One only needs think of the text published in the March-April 1959 issue of the brand new critic magazine Liberté. The anonymous author of these insults was nevertheless not unaware that many people from all walks of life were, are and will be caught by the window dressing of dictatorships from the left and right, but back to our story. A Czech organization working in the field of international trade, Podniků Zahraničniho Obchodu Motokov, the Motokov Enterprises mentioned in the legend of the photograph that introduced this article, presented a Škoda Felicia automobile to Richard. Said automobile was shipped to Canada at the expense of the Czech government. I feel that you are eager to learn more about Felicia. Yes, yes, don’t deny it. A Škoda Felicia automobile on display at a vintage automobile show, Lahti, Finland, May 2010. Wikipedia. The story of the Felicia began in 1959 with the introduction of the Škoda Octavia, an automobile produced by the aforementioned AZNP. Agile, economical and reliable, this vehicle was very popular in its home country, as well as abroad. AZNP manufactured around 286 000 Octavias between 1959 and 1964. The Felicia was the convertible version of the Octavia. This being said (typed? ), a rigid detachable fibreglass roof was available. Nearly 14,900 examples were produced between 1959 and 1964. Would you believe that it was possible to start the Felicia and, in all likelihood, the Octavia by using a crank, as was done at the time of the Ford Model T? The opening for said crank was hidden behind the license plate of the vehicle, which could pivot downward. As agile, economical and reliable as its stable mate, the Felicia was also very popular in its home country, as well as abroad. There were a few dealers in North America, for example, including at least one in Québec and California. Felicias could also be seen in several 1960s European movies and, oddly enough, a Japanese one and an American one. The 1964 science fiction / horror television movie The Creeping Terror was / is arguably one of the worst movies in history. On the other hand, S-a furat o bombà, in English A bomb was stolen, was a 1961 dialogue free Romanian spy comedy that won a few awards. The Felicia of a Québec dealer named Adélard Gosselin travelled about 145 000 kilometres (about 90 000 miles) before being stored. A mechanic specializing in automotive sheet metal fascinated by automobiles, Jacques Audet of Sainte-Hélène-de-Breakeyville, not far from Québec, Québec, undertook the restoration of this vehicle around 1988-90. He worked for 2 years on this project, his first car restoration. Audet’s Felicia won a first prize in the imported automobile category of the 1994 edition of the Granby international de voitures anciennes, one of the most important elegance competitions in Canada. Spring is coming soon, my reading friend, get ready. We will meet again, figuratively of course, next week, if the flying spaghetti monster wills it.